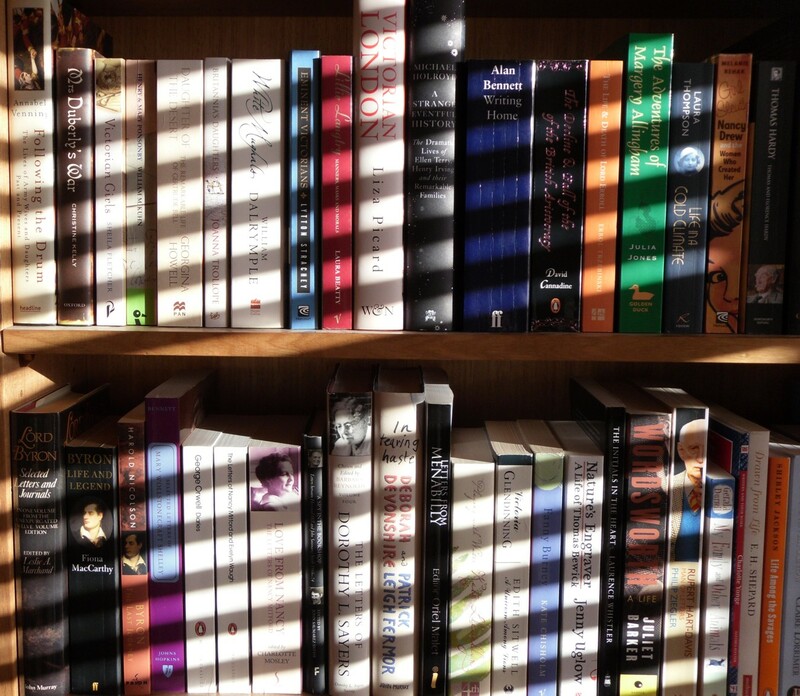 As can be seen from her bookshelves, Lyn is a prolific reader and here she writes of why she began her blog and the joys of writing it. I set up the blog on my summer holidays in early 2010. I started in a burst of enthusiasm but the thought was there at the back of my mind that I might lose interest once I got back to work or just might not have the time. What if nobody dropped by? What if nobody was the least bit interested in yet another blog by a book-obsessed librarian who wasn’t interested in reading the latest bestsellers or the Booker shortlist? Well, the blog was a reading diary first of all so I told myself it didn’t really matter. My online group were very supportive, the bloggers added me to their blogrolls & popped over to read & comment. Gradually other readers who loved 19th century fiction, early 20th century middlebrow novels, classic crime, history & biographies found the blog through a Google search or through a comment I left at another blog. They came, they read, they commented & recommended other books & the feeling of being part of a community just grew. Although books are the main topic, my cat, Abby, became a much-loved presence on the blog & I often had enquiries from her fans if she didn’t make regular appearances. When Abby died in May, I was very touched by the many sympathetic comments left by those who loved seeing her pretty face & hearing about her gentle adventures. Now, there’s Lucky & Phoebe, two new cats to get to know. I’m not much of a gardener but Abby’s rose garden will be featuring in the spring & summer as the roses grow & bloom. I think that the community feeling is one of the reasons that I’m still blogging, over 18 months later. I love checking my favourite blogs to see if there’s a new post & I hope that the kind readers who visit my blog feel the same. Blogging has made me think more about what I read. I always have a pile of post-it notes beside me to mark a passage or a quote I might want to refer to in a post. Blogging & reading other blogs has also greatly increased the number of books on my tbr shelves. It’s introduced me to new authors & inspired me to take a book from the shelves & read it right now because of an enthusiastic review on a favourite blog. So, even if no-one read my blog, it would still be a worthwhile record of my reading life. Of course, I’m pleased that people do read & comment, it adds to the sense of connection that I’ve found in the blogging world. That sense of connection is highlighted by the way that I “met” Christina who kindly invited me to write this post. Christina found my blog through one of my Sunday Poetry posts & a friend of hers recommended my blog because I’d also written about Miss Read. Then, she came across my post on Jane Eyrejust after watching a program on one of the possible sources for the location of Thornfield. She emailed me & we talked about our passion for the Brontёs & then I popped over to this blog & another virtual friendship was born. That kind of serendipity is why I love blogging.